This poem is one of those poems I never thought I would edit. But I got the cajones last night to dig in (since I was in our new library room and felt compelled to be awesome) and found that the poem really took on its own persona. So here is my advice for editing a highly personal poem. So the first is easy… giving any poem time to breathe is really important… I say 6 months to 1 year, but in this case at least 2 years is advisable… all the emotions need to carmelize, and more than that, you need to get out of your own head. Getting the concept and not the lines is hard. There will be things that stick out to you… you can keep them (you will see identical lines in my pieces) but otherwise stick to an idea rather than a word. Talk around what happened. Don’t say it, or how you felt, or where you were… that’s all heresay… find a Truth around your emotional experience that applies to all of us rather than a norm. Having a norm will be too personal, and it won’t be a poem. Let go of your pretenses and write it down… it can be easy to block yourself up by trying to make it great, it will be great if you let yourself write it how it comes… and of course edit. 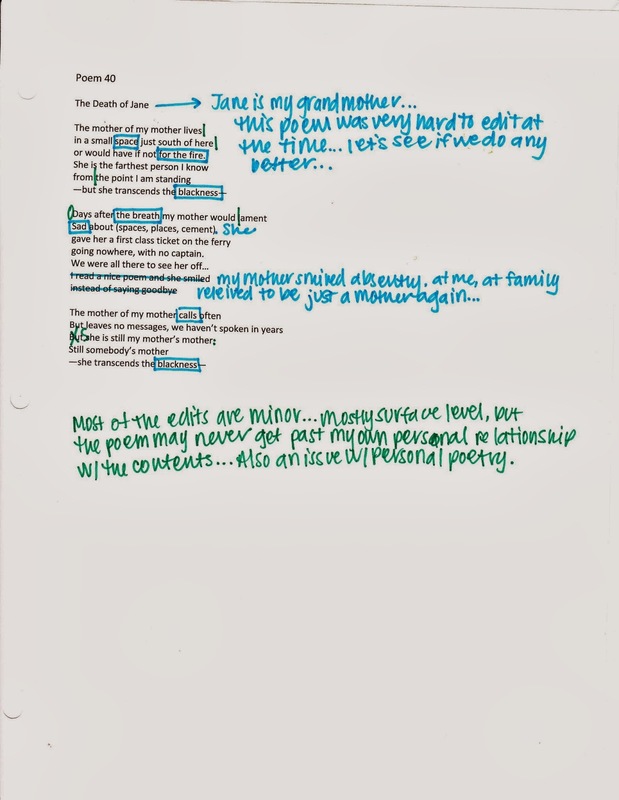 You need to bring quite a few tools to the table to revise a personal/emotional poem. The first of those is time, and I can’t stress this enough… also don’t do it in the wrong mood or without the right openness. These things will limit your ability to transcend the origional. You will br great, just keep writing.